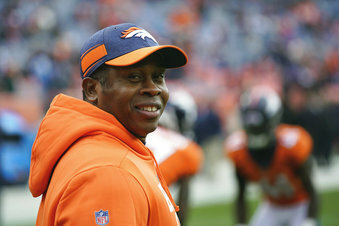 PHOENIX (AP) — Former Denver Broncos head coach Vance Joseph has been hired as the defensive coordinator on new Arizona Cardinals coach Kliff Kingsbury’s staff. Joseph has just one season’s experience as a defensive coordinator, in 2016 with Miami. His Dolphins ranked 29th in total defense (out of 32 teams) and 18th in points allowed. Joseph, 49, ran a 3-4 defense, the scheme that Keim said he wanted to return to because it best fit the Cardinals’ personnel. Arizona ran a 3-4 defense for Bruce Arians’ five seasons as head coach but switched to a 4-3 last year for Steve Wilks’ one season with the Cardinals. Davis returns to Arizona, where he was defensive coordinator under Ken Whisenhunt in 2009-10 and linebackers coach in 2007-08. He was part of the Arizona staff during the Cardinals’ surprise run to the Super Bowl following the 2008 season. He spent the last two seasons as linebackers coach for Ohio State after serving as defensive coordinator of the Philadelphia Eagles for three seasons (2013-15). Davis also has NFL assistant coaching experience with Carolina, Cleveland, Green Bay, Atlanta, the New York Giants and San Francisco, where he was the 49ers’ defensive coordinator in 2005-06 before coming to Arizona. Rodgers, an 18-year coaching veteran, came to Arizona with Wilks. Under his tutelage, punter Andy Lee was among the league’s best and undrafted rookie Zeke Turner led the NFL with 13 ½ solo special teams tackles. The Cardinals also recovered a blocked punt for a touchdown in their season finale against Seattle.